Kunitsuna (国綱), the youngest of the Six Awataguchi Brothers, was a very interesting figure. The Kotô Meizukushi Taizen states that he was born in Chôkan one (長寛, 1163) and that he moved at the request of the bakufu to Yamanouchi (山内) to the outskirts Kamakura when he was 42 years old, what would mean in Genkyû two (元久, 1205). The latter quote is found for the first time in the Muromachi-era sword publication Nôami Hon Mei Zukushi (能阿弥本銘尽, publ. 1483) by the way. At that time, Hôjô Tokimasa (北条時政, 1138-1215) was regent of the Kamakura-bakufu but most other sources quote Hôjô Tokiyori (北条時頼, 1227-1263) as the one who invited Kunitsuna – during the Kenchô (建長, 1249-1256) era – to Kamakura. The Kotô Meizukushi Taizen again says that Kunitsuna died in Kenchô seven (1256) at the age of 93. This would mean that he was working only about six or seven years for Tokiyori, what might be just enough when we bear in mind that he acted there as co-founder of a group of outstanding swordsmiths who developed a new forging tradition. In addition, Tokimasa was the very first Hôjô regent and held this post for less than two years. So it seems rather unlikely that it was him who invited all the swordsmiths as he was surely more busy with getting established the shikken regency of his family. And apart from that, we know that Tokiyori was one of the most renowned sword connoisseurs of his time. Incidentally, the Kenchô era equals his time as shikken. So either Kunitsuna did all what he did in Kamakura at a very high age and over the very last years of his life, or he was not born in 1163 as stated by the Kotô Meizukushi Taizen. But we also can’t rule it out completely as Tokiyori did not randomly recruit smiths but selected the greatest masters of his time, for example also Saburô Kunimune (三郎国宗) and Ichimonji Sukezane (一文字助真) from Bizen Province, and it is assumed that he as sword expert and political key figure of Kamakura not only wanted to have superior cutters but blades that would impress his circles on the basis of their aesthetical appearance. Thus it is possible that he asked the old master Kunitsuna and last survivor of the Six Awataguchi Brothers if he would come to Kamakura to lead a group of local smiths. There is, or rather was, a jûyô-bijutsuhin ôdachi (nagasa 114.5 cm) from the former possessions of the Uesugi (上杉) family that is regarded as kind of proof of Kunitsuna being in Kamakura around Kenchô but the whereabouts of the blade are unfortunately unknown (it is said that it had been confiscated by the occupying forces after WWII). The mei of the blade reads “Kamakura-jû Tôroku Sakon Kunitsuna” (鎌倉住藤六左近国綱) and the date “Kenchô gonen hachigatsu hi” (建長五年八月日, “a day in the eighth month Kenchô five ”). The records of the Uesugi claim that this ôdachi was made by Kunitsuna at the same time he made the Onimaru for Hôjô Tokiyori and that it was handed down within the family at the latest since the old times they held the post of Kantô Kanrei, i.e. the Kantô region deputy of the shôgun, what was at the beginning of the Nanbokuchô period. But the records even claim at another point that the blade was initially owned by the ancestor of the family, Shigefusa (上杉重房, mid-Kamakura), when he moved from Kyôto to Yamanouchi during the Kenchô era. Well, the blade is lost as mentioned so not much can be said about the authenticity of its mei. Also that it once got the status of jûyô-bijutsuhin doesn’t mean much because at pre-WWII times, coming from a big daimyô collection often weighed more than actual quality and authenticity. There are a few tantô with the mei “Yamanouchi-jû Kunitsuna” (山内住国綱) going round but most experts agree that they were made noticeably later, i.e. end of Kamakura to Nanbokuchô, and, if authentic, might be works of a local descendant of Awataguchi Kunitsuna. Picture 1: ôdachi, jûyô-bijutsuhin, (hardly legible) mei as stated above. But let us see things from the point of view of Tokiyori. As a man of his rank, he had no other choince other than picking the crème de la crème of what was available his time, and this was Yamashiro, Bizen and Bitchû. We don’t know why he didn’t pick one of the great Ko-Aoe masters who had acted as goban-kaji too but as far as Yamashiro is concerned, only the Awataguchi school was active at that time as the de facto Rai founder Kuniyuki (国行) was just at establishing his school (he was active around Shôgen [正元, 1259-1260]). Of course there were also other skilled smiths active at that time, e.g. from the Hôju, Môgusa, or Ko-Naminohira schools, but none of them was so to speak “worthy enough” in terms of then ranks of craftsmen to aid the Kamakura regent with creating a new forging tradition. The same applies to the time-honored Yamato tradition. Many smiths were working in Yamato province since earliest times but their greatest masters were active significantly later than Tokiyori had started his initiative, for example the Tegai school founder Kanenaga (包永), the Shikkake school founder Norinaga (則長), and the Taima school founder Kuniyuki (国行) around Shôô (正応, 1288-1293), and the Hoshô school founder Kunimitsu (国光) around Kôan (弘安, 1278-88). While on the subject of Kunitsuna’s career, his name is also found on the questionable list of the six goban-kaji who allegedly worked for Gotoba in Jôkyû two (承久, 1220) in his exile on the island of Oki. Kunitsuna was granted with the honorary title Sakon Shôgen (左近将監) and bore the first name Tôroku (藤六) (also as background info for the Uesugi blade introduced in picture 1). Due to his long life and his move to Kamakura, we are facing two different styles and differences in signature when talking about Kunitsuna. That means a slender and more elegant Yamashiro and Awataguchi style from his earlier years, and a more powerful style that emerged with his move to Kamakura. Well, this is the commonly forward theory but signed works of Kunitsuna are very rare (only eight are in existence to my knowledge) and so we can’t nail down for sure his exact artistic stages and the chronological backgrounds for his change of workmanship and signature but fact is, that the majority of extant works shows a more powerful style. That means, if he had worked most of his life in Kyôto and moved only towards the very end of his life to Kamakura, then actually more true Awataguchi-style blades should be extant. But on the other hand, it is also possible that he was more productive after having arrived in Kamakura, or that these blades were held in higher esteem and thus more often handed down than his earlier Yamashiro blades. Or the traditions are incorrect and he arrived in Kamakura at the prime of his career. Anyway, the first blade that I want to introduce is one that is thought he made whilst still in Kyôto (picture 2). It is a relative short jûyô-bunkazai tachi with an elegant and slender sugata with a koshizori and a pronounced funbari. The kitae is a dense ko-itame with plenty of ji-nie and a nie-utsuri and the hamon a ko-midare in ko-nie-deki that is mixed with kinsuji and whose nie increase noticeably from the monouchi upwards. The bôshi shows nie-kuzure and has a ko-maru-kaeri. The tang is ubu, relative long and in kijimonmo-gata. It has to be pointed out that the niji-mei is somewhat smaller than the other known mei. The blade was once worn by shôgun Tokugawa Yoshimune (徳川吉宗, 1684-1751) and Ienari (徳川家斉, 1773-1841) and was submitted for jûyô-bunkazai by Tokugawa Iesato (徳川家達, 1863-1940) in 1931. Since postwar times, it is preserved by the Tokugawa Reimeikai Foundation. His most famous work is of course the aforementioned Onimaru (鬼丸) which can be seen in picture 3. Unlike the small Awataguchi-style tachi from picture 2, it is wide and magnificent. It has a deep toriizori with pronounced funbari, plenty of hira-niku, does not taper that much, and has a chû-kissaki that tends a hint to kamasu. The kitae is a ko-itame mixed with ko-mokume, plenty of jinie, and some jifu and the hamon is a wide notare-based midareba in ko-nie-deki that is mixed with chôji, ko-ashi, and yô. 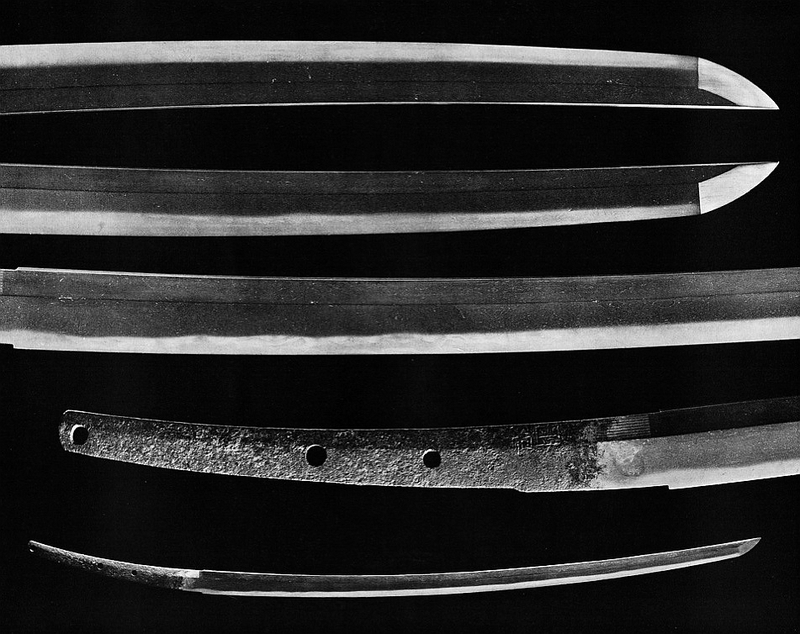 A prominent feature of this blade is the diagonal yubashiri-based koshiba that appears somewhat above the ha-machi, an approach in hardening, that is seen in slightly different ways also on his other Kamakura-style blades. Please note that the term “Kamakura-style” is not really a fixed nihontô term. I just use it here to distinguish between his early elegant and his late powerful blades. The bôshi of the Onimaru is a widely hardened midare-komi with a ko-maru-kaeri and much nie. The tang is ubu, curves strongly, ends in a kurijiri, and shows shallow katte-sagari yasurime. After being a heirloom of the Hôjô, the sword was owned by the Ashikaga family and went later through all the “prominent stations,” i.e. Nobunaga, Hideyoshi, Ieyasu, and was later presented by the Tokugawa to Emperor Meiji. 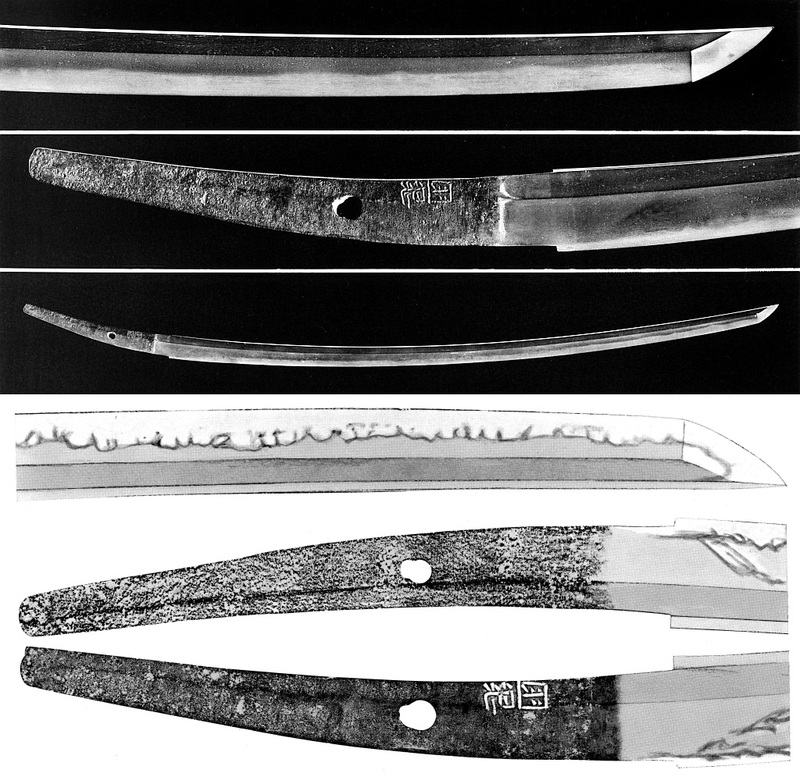 A blade that is close to the Onimaru in terms of workmanship and mei (although the tang has suffered somewhat in that area) is the tokubetsu-jûyô shown in picture 5. The blade is a little tired and lost some substance towards the tip but is otherwise outstanding. The kitae is a somewhat standing-out itame with nagare and ô-hada along the omote side and shows ji-nie and a faint nie-utsuri. The hamon is a ko-nie-laden suguha-based ko-chôji mixed with some gunome, ko-midare, ashi, yô, and sunagashi and kinsuji along the lower half. The bôshi is sugu and has a ko-maru-kaeri. The nie-utsuri forms a kind of mizukage-like appearance at the base, that means we see a certain approach in hardening that Kunitsuna’s later blades seem to have in common. The sword was once a heirloom of the Nishitakatsuji (西高辻) family that served on a hereditary basis as shintô priests the Dazaifu Tenmangû on Kyûshû. Next the jûyô-bunkazai that is preserved in the Hie-jinja (日枝神社) (picture 6). The blade is suriage and shows a dense ko-itame with plenty of fine ji-nie and a chôji-midare with ashi and yô that gets more nie-laden and displays conspicuous kinsuji and sunagashi along the lower half. The bôshi appears as somewhat undulating sugu-chô or notare-komi with a rather wide ko-maru-kaeri and some hakikake on the omote side. 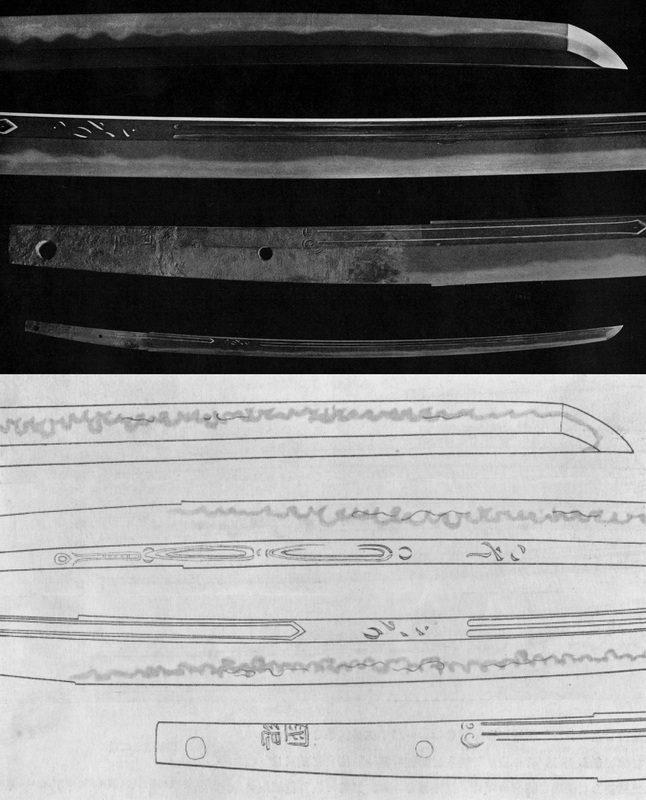 Interesting here are the horimono in the form of a futasuji-hi with bonji and suken on the haki-omote, and a bonji and a shiketsu on the ura side, the end of both lower engravings running due to the suriage into the tang. There was some discussion about if this might be a work of a different smith with the same name, mostly because the uncommon horimono and the relative sophisticated hamon, but in the meanwhile, it is accepted that it is a work of Awataguchi Kunitsuna. The next tachi is a tokubetsu-jûyô and is more slender, deeply curved, and ends in a ko-kissaki. The jigane is a rather stading-out itame that is mixed with nagare, mokume and ô-hada and plenty of ji-nie, some chikei, and we see again the mizukage-like feature at the base that turns here into a jifu-utsuri which runs then all over the blade. The hamon is a widely hardened and nie-laden suguha-chô mixed with some notare, ko-chôji, ko-midare, thick ashi, yô, sungashi, kinsuji, and some hotsure, uchinoke, and yubashiri in places. The bôshi is sugu with a short ko-maru-kaeri and a hint of hakikake. The prominent jigane distinguishes Kunitsuna from his older Awataguchi brothers and the jifu-utsuri and strong nie (with visible ha-nie) make this blade look like Ko-Bizen or Ko-Hôki at a glance. But Ko-Bizen works from that time show a brighter nioiguchi and although they do show nie, they do not occur in that amount like here. And for a Ko-Hôki work, the steel is too bright, i.e. Yasutsuna and his contemporaries forged a more blackish jigane and their hamon has a more subdued nioiguchi. Apart from that, their works show more ha-hada, an overall even more standing-out hada, and have altogether a more rustic appearance. 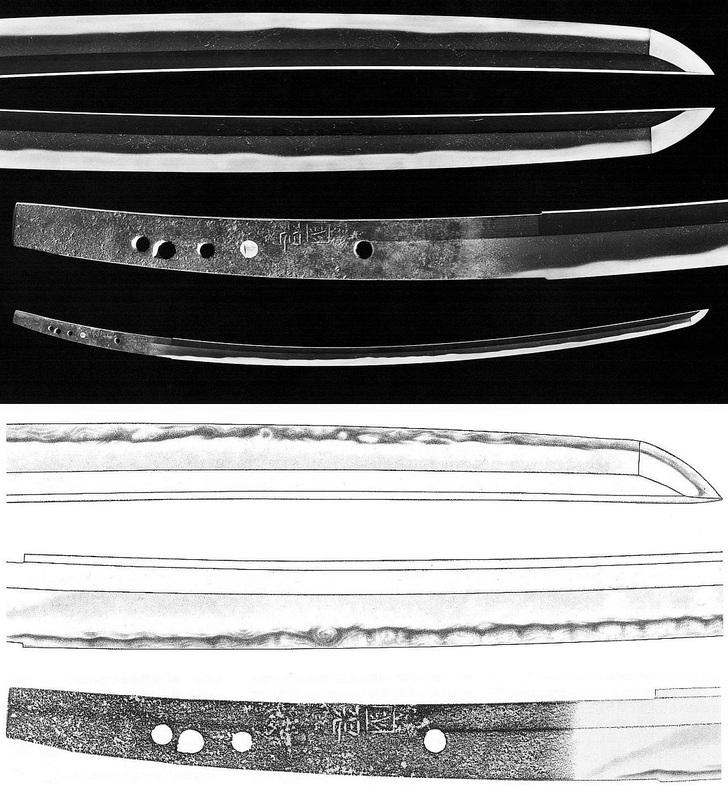 And finally I want to address the fact that there are several blades going round, some quite old and of highest quality, that are signed with the niji-mei “Kunitsuna” but not attributable to Awataguchi Kunitsuna, at least not according to modern standards. 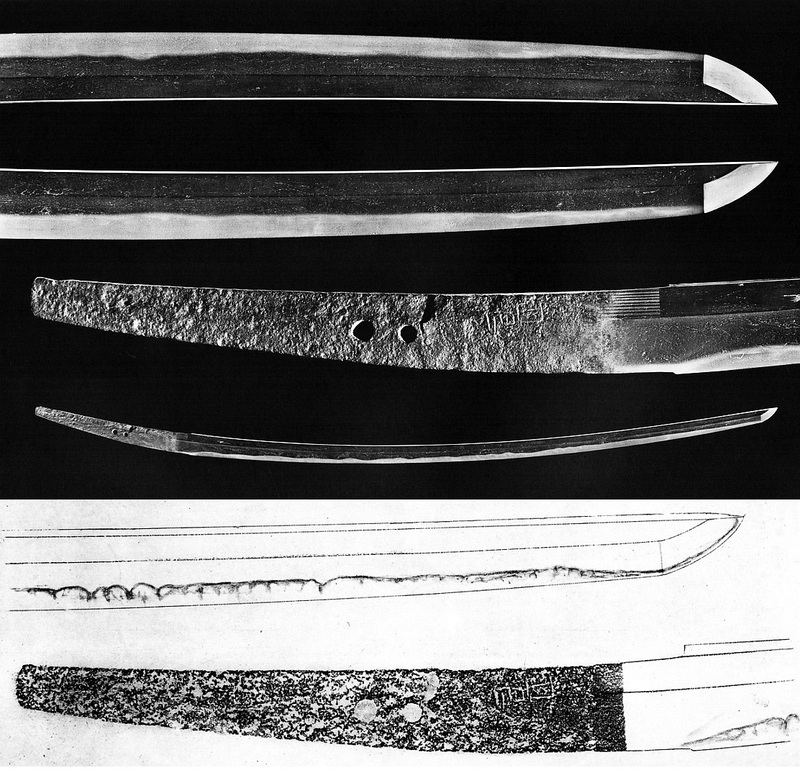 The blade shown in picture 8 was a heirloom of the Ii family and offered by Ii Naonori (井伊直憲, 1848-1904) to the Iinoya Shrine (井伊谷宮) where it is preserved today. The records of the shrine say Awataguchi but this is dismissed and the jûyô-bunkazai designation also says “Kunitsuna, Kamakura period, province unknown.” The blade is a little suriage but maintains its elegant and tapering sugata with the koshizori that bends down towards the tip and the pronounced fubari that dates it at the latest to the early Kamakura period. So if it should turn out that it is a work of Awataguchi Kunitsuna, then surely from his early artistic period. The kitae is a dense but standing-out itame with some masame and fine ji-nie. The hamon is a midare that gets gradually wider towards the tip and that is mixed with chôji, even some kawazu-no-ko chôji, ashi, yô, kinsuji and sunagashi. There are nie which also appear in the bôshi. The bôshi is notare-komi with a ko-maru-kaeri. The signature is large and noticeably different from the other Kunitsuna mei. Incidentally. The jûyô-bunkazai designation says about the attribution that there were, among others, also a Bizen, Yamato, and an Iga Kunitsuna but it is difficult to say whose work it acutally is. And then there is a jûyô-tachi whose signature is smaller and somewhat different (especially the character for “Kuni”) but of about the same typeface as the Onimaru and the tokubetsu-jûyô from picture 5, but which still got a conservative attribution via “Den,” i.e. 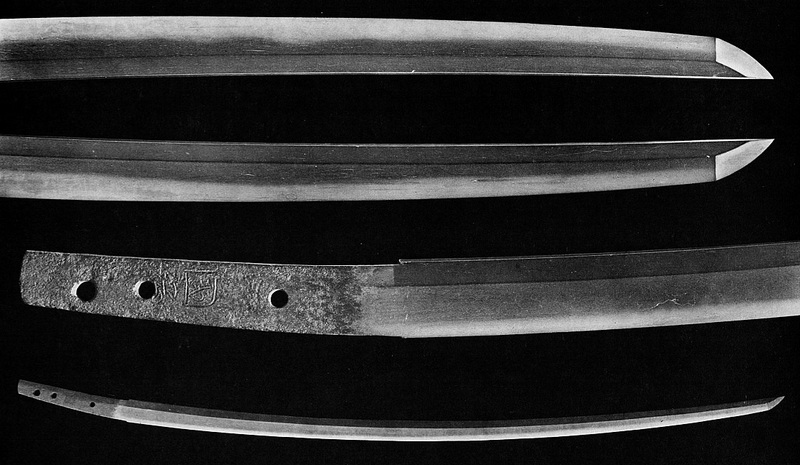 “Kunitsuna (Den Awataguchi).” The blade is slender, has a deep koshizori that bends down towards the tip, a ko-kissaki, and interestingly a maru-mune. The kitae is a dense ko-itame with ji-nie and a jifu-utsuri and the hamon is a suguha-chô mixed with ko-midare, ko-chôji, many ashi and yô, and fine sunagashi and yubashiri. The nioiguchi is wide and the ha is full of nie. The bôshi is sugu with a short ko-maru-kaeri. The shinsa placed this blade on the basis of its jiba and sugata into the Awataguchi vicinity, i.e. to the earlier phase of Kunitsuna. The blade was once a heirloom of the Date (伊達) family who had received in from the court noble Konoe Motohiro (近衛基熈, 1648-1722). Now we are through with the Six Awataguchi brothers and next post will continue with the Awataguchi main line, i.e. Norikuni (則国), Kuniyoshi (国吉), and Yoshimitsu (吉光) before we close the school with the remaining noteworthy Awataguchi masters. I would like to have the juyo papers and description that was added to the saya of the Ichimonji tachi I have which went juyo years ago (47 the session). How do I send a copy of the papers to you? Easiest way is mailing me scans/pics of the juyo papers and of the sayagaki to “markus.sesko@gmail.com”.